Roland Schimmelphennig's Peggy Pickit Sees the Face of God, on-stage last fall as part of Another Africa, was deceivingly naturalistic in its depiction of a dinner party gone wrong, save for the African statue that watched over the group. His latest work to hit the Toronto stage, The Golden Dragon, is a more overt exercise in the magic realism that colours the playwright's work. The Golden Dragon delights with its wild abandon for the laws of the universe. The five member crew of The Golden Dragon restaurant (David Fox, Lili Francks, Tony Nappo, Ansuree Roy, and David Yee) work like a well-oiled machine servicing patrons beyond the kitchen walls. On this day, however, the tooth ache of one of their own sends the kitchen into a frenzy. In floors above and units adjacent, we are introduced to the tenants of the building — which include a couple newly pregnant, a husband recently cheated on, and a drunk shop owner — all with connections to the restaurant below. Like options on a menu chosen at whim, each vignette provides a slice of information about the community. The dynamic alley theatre setting allows Manson to transition effortlessly with quick lighting changes. The piece never gets bogged down with the movement from scene to scene. The playwright's signature touches, the insertion of spoken stage directions and the portrayal of characters so far from the actor's own self (the most exaggerated being David Fox playing a young female flight attendant), are handled with sincerity from a willing cast. Schimmelphennig adds another dimension to the plot through the introduction of Aesop's fable of the Ant and the Grasshopper. It starts off familiar enough, with the ant extolling the virtues of hard work, but becomes more perverse as it unfolds. The fable bleeds into the established storylines to wonderful effect. The ensemble works well to bring the material to life. Roy proves that she doesn't have to write the play to be the stand out element; her characters command the stage. Fox and Nappo have genuine fun playing flight attendants. Fox especially is a joy to watch — he jumps into the challenge head first. Manson could have done without the Brechtian theatrics before the play proper. It's difficult to tell actors to be themselves, as there will inevitably be some element of performing when the conditions force it. With no intermission, there are a few false endings where things seem poised to conclude — these are small drops in tone and pace. The set and costumes from Teresa Przybylski greatly serve the rotating scene and character changes. While the set feels ultimately utilitarian, it's the vibrant lighting design from Rebecca Picherak that divides the grey block into different playing spaces. There is also the most inventive use of fake blood in recent memory, used initially to punctuate a comedic moment and later repeated to portray a gruesome scene. With a fragmented narrative and images that reach beyond the confines of what's seemingly possible, The Golden Dragon won't be everyone's cup of soup. But the strength of Schimmelphennig's explorations can't be beat under direction from Manson — it's the highlight of Tarragon's season thus far. 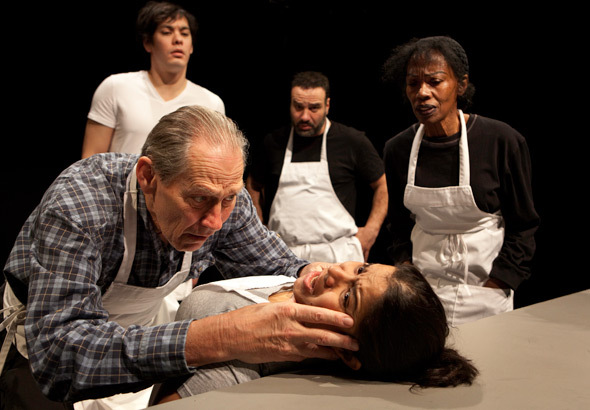 The Golden Dragon, written by Roland Schimmelphennig and directed by Ross Manson, runs at the Tarragon Theatre until February 19.